Almanac provides the Biere de Chocolat (that's French, you know), you provide the cupcake. 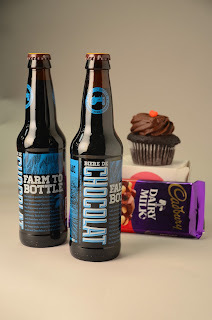 Our aim was to create a beer bursting with cocoa flavors and aromas, balancing sweet and savory to create a complex but quaffable chocolate brew. To accomplish this we partnered with Dandelion Chocolate in San Francisco to create this rich brew brimming with chocolate character. Working with the unique flavors of Dandelion’s single-source beans, we created this decadent beer by layering in smoked and dark-roasted malts with citrusy Ivanhoe hops from Clearlake, CA. Finally, we added a blend of hand-roasted cocoa beans sourced from Madagascar and Río Caribe, Venezuela.